Its been 5 years since I last did a blog post about the Camel numbers. Just to do a quick post on some of the numbers for the Apache Camel project in year 2016. Number of committers doing commits in 2016: 192 (git shortlog --after 2015-12-31 --before 2017-01-01 -ns | wc -l). You can find more statistics at github and Open Hub. Happy New Year and 2017 is going to be a special year for Apache Camel. Just because its Christmas does not mean the Camel stands still. On the even of the 23rd I took the evening to do a bit of research and start hack on a little prototype for an Apache Camel plugin for IDEA. Its something that has been on my radar for a longer time. The reason is that Apache Camel provides a catalog with has a ton of great information for tooling. The catalog includes every little detail about every Camel component, EIPs, data formats, languages, and much more. I have long wanted to have a little plugin for IDEA (and also Eclipse if possible) for code assistance to setup Camel endpoints - in other words, having ctrl + space to show a list of Camel options you can use on any given Camel endpoint. So in the darkness of the night I found myself back in Intellij IDEA plugin land. It was a long long time since last time I hacked on a IDEA plugin. It was so many years ago I cannot remember exactly, but it was around 2002. I created a little plugin called Generate toString which would generate nice toString methods for your POJO classes, like you can generte equals/hashCode etc. Over the years that followed I maintained the plugin and upgraded it for newer IDEA versions which would often break the plugin, or they have moved/changed their APIs. Back then the plugin API was hardly documented, and there was no source code of the editor itself, so it was no fun to try to figure out how to get it to work again, or how to use some of the existing IDEA dialogs etc. But in the end it was possible, and for a few dialogs I actually had to build it myself using Java Swing etc. 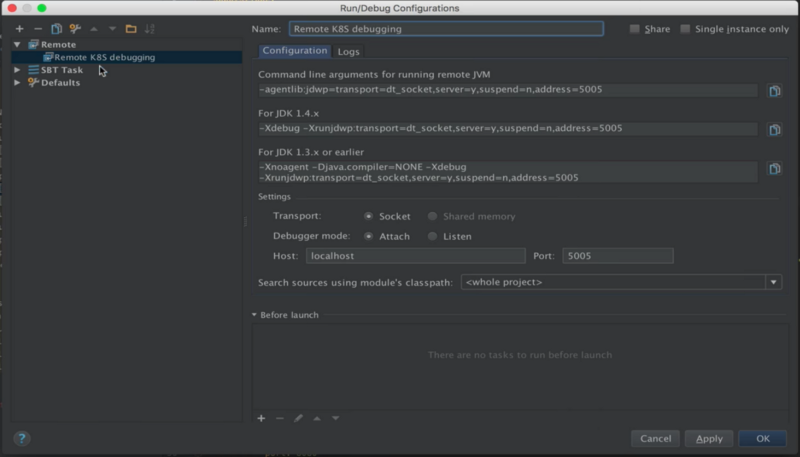 The plugin later found a new home at Jetbrains where they took over and provides the plugin out of the box in IDEA. Thanks Jetbrains. You make the best editor on the planet. Fast forward to 2016 and I was back in somewhat familiar waters, the AST model is still named PsiSomething. However doing a plugin that hooks into the Java language of IDEA took a while to find out, because I was walking down the wrong path, trying to find an extension-point about smart completion. So instead I looked at some of the out of the box plugins as you can find their source code, and eventually found a plugin that hook into the Java language which took me down the right path. So after a while I got something working, which was marvelous to see that the smart completion suggestion list included the Camel endpoint options for the given component. Today on the 25th December I do have a bit more time as well to polish up the code and to publish it on github. I have created a new project on github where we can hack on the code to make the plugin awesome and great. The intention is that the code eventually will be donated to Apache Camel. But for now we can keep it separated so its easier because there is only the plugin code, and not all the other Camel source as well. You can find more details on the github page, where there is instructions how to try / run and build the plugin. There is also a issue tracker with tickets for stuff we need to work on. Anyone is welcome to help with the plugin. Sadly I don't have so much time currently to justify spending days hacking on the plugin, even thought it would be really fun. 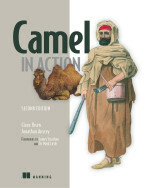 I have to focus on completing the Camel in Action 2nd edition book. I am 85% complete with the microservices chapter, and then have another chapter to complete as soon as possible in the start of 2017. However I am also a human whom want to have a bit fun hacking so I will hack a bit from time to time on the plugin. A shameless plug for the book, there is a 40% discount code during the holidays. Jonathan and I just wanted to give an update on the status of the book, now that we are entering 2017 which will be the year the book is finished. Before summer 2017 we all have the final book in our hands. Manning have told us the book is doing well, and they have granted us with a special x-mas holiday promotion code. Yesterday we send out the following letter to our readers of the Camel in Action 2nd edition book. 2016 is coming to an end and we are well aware that we need to hurry up and complete the remaining chapters. Claus has been busy of late with personal "stuff" which has taken away time and energy that he would otherwise have put toward the book. However the "stuff" is clearing up and he has free time to get back in the saddle and into the writing zone. He is on track with the popular microservices chapter that will be ready in the beginning of 2017. Jonathan is closing in on having chapter 15 ready as well for the beginning of 2017 where a new MEAP update can be expected. Then there are two more chapters scheduled. Claus will work on a container chapter that covers all the exciting new technologies with containers, Docker, Kubernetes, cloud, and so on. We are very pleased that Henryk Konsek has agreed to be our guest author on a chapter about Camel and IoT. We are revising the TOC and have decided to fold chapter 17 and 18 together into a single chapter about Camel, containers, and cloud where clustering is natural. This also means there is one less chapter and the book will be finished sooner. After all the chapters are complete, we will revise every single chapter with all the feedback from the reviews and from our technical editors. So expect the material to sharpen up, and be much more fluent and pleasant to read when the proof editors have done their magic. Its been a while since I last did a Camel video. 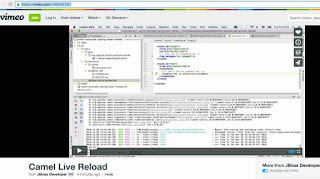 So today I recorded a video of the upcoming live reload functionality in Camel 2.19. You can now enable live reload of your Camel XML routes which will trigger a reload on-the-fly whenever you save the XML file from your editor. This is demonstrated in the short 5 minute video. And for other use-cases you can enable this manually be setting a ReloadStrategy on the CamelContext. We provide the FileWatcherReloadStrategy out of the box, which is what is used above as well. However the idea is that end users can provide their own custom strategies as well. 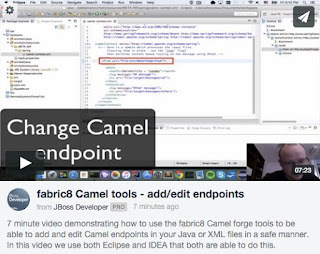 I have previously blogged about the fabric8 Camel Maven Plugin which is able to parse your source code and parse all the Java RouteBuilder and XML routes and report invalid Camel endpoints. That was in the start of 2016. Now at the end of 2016, the code has stabilized and the fabric8 team has gracefully donated the source to to ASF so it will be included out of the box from Apache Camel 2.19.0 onwards. To see the plugin in action you can watch the video from my previous blog. The plugin would work the same when its from Apache Camel. - Spelt the sendToAll option with a lower case a. As you can see it discovered 3 invalid endpoints, and reported suggestions what is the error. By default the maven goal does not fail maven itself, and hence why you see BUILD SUCCESS. The plugin has a number of options you can configure. For more information see the Camel Maven Plugin documentation. PS: The plugin also parses your Simple expressions and report invalid configurations as well. We may in the future add parsers for other languages so we can parse XPath, XQuery, Groovy and others. 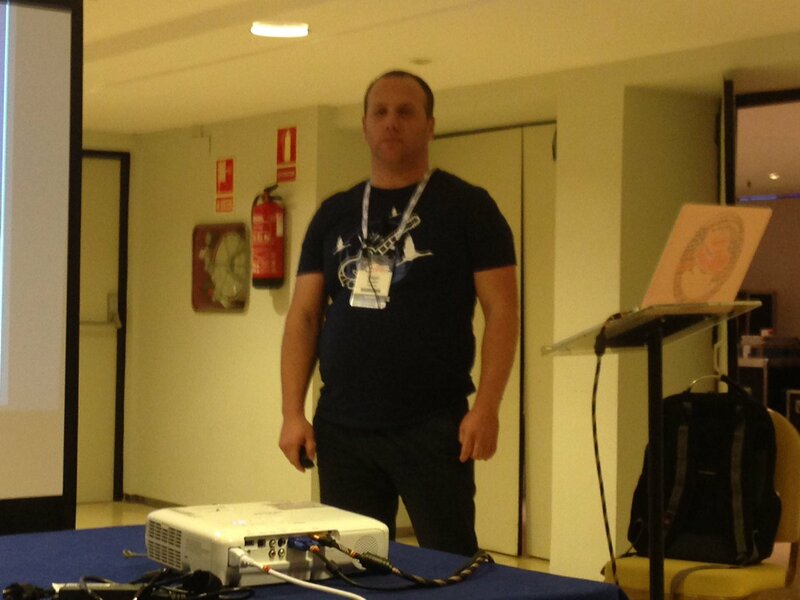 This week I attended my first (but not my last) ApacheCon in Sevilla Spain. The event is co-hosted with Apache Big Data that runs monday and Tuesday and then ApacheCon from Wednesday till friday. 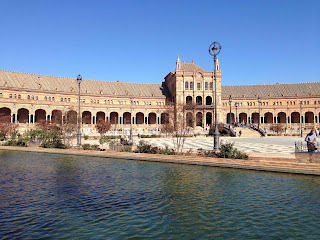 I had the opportunity to travel to Sevilla on monday, and therefore had Tuesday as full day for sight seeing and attending a few talks at Apache Big Data. Fellow Camel rider Jean Baptiste co-presented Apache Beam which seems like a really interesting project. It provides an unified API and DSL on top of various big data implementations such as Apache Flink, Hadoop, Storm, and what else is out there. I talked to Jean about a potential integration between Beam and Camel. It would open up the number of systems that Beam could ingest data from using the many Camel components. In the hallway I meet Krzysztof Sobkowiak from the Apache ServiceMix project, so we took the opportunity to take a selfie. Kudos to Krzysztof for getting involved with ServiceMix so this project can get some releases out the door from time to time. In the afternoon I went for sightseeing and I must say Seville is a beautiful city with parks, historical buildings, big cathedral and a bull fighter arena. All within walking distance in the city center. The Plaza de Espana is particular impressive (see link on wikipedia for more impressive photos). Supposedly some footage of Star Wars and Game of Thromes was filmed there. 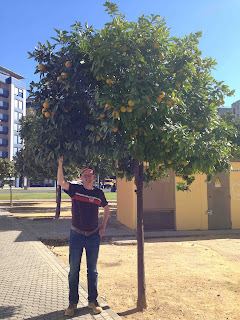 A friend of mine had be in Sevilla before and he told me about the many citrus trees in the streets, which was not so hard to find. 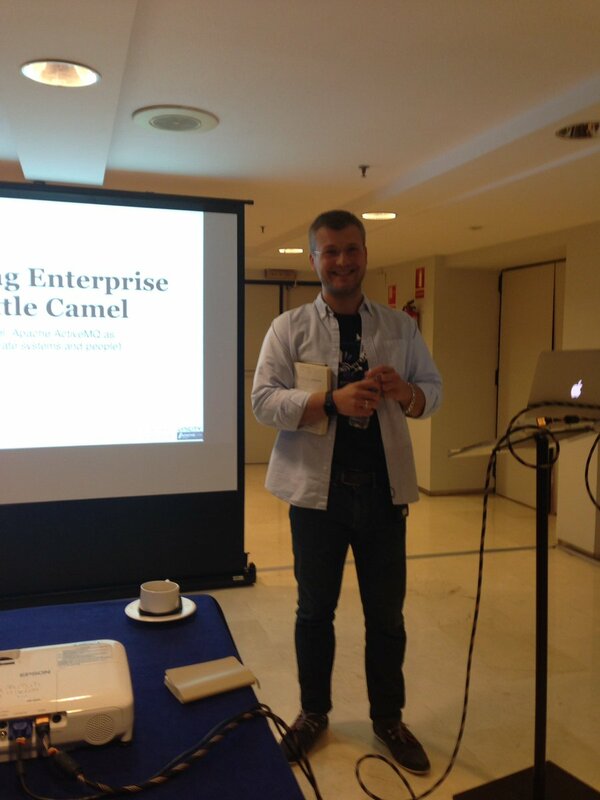 On thursday I kicked off a series of Apache Camel talk. 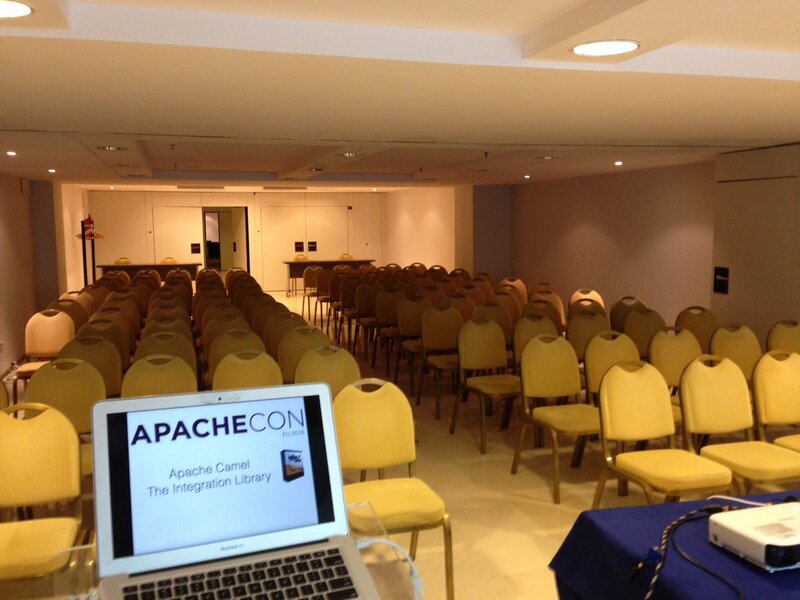 My talk was an introiuctinary talk as there is still many people who are not aware of Apache Camel - even at ApacheCon. However my first thought was that everybody knew Camel and people wanted to sleep in, as 10 minutes before my talk the room was empty. 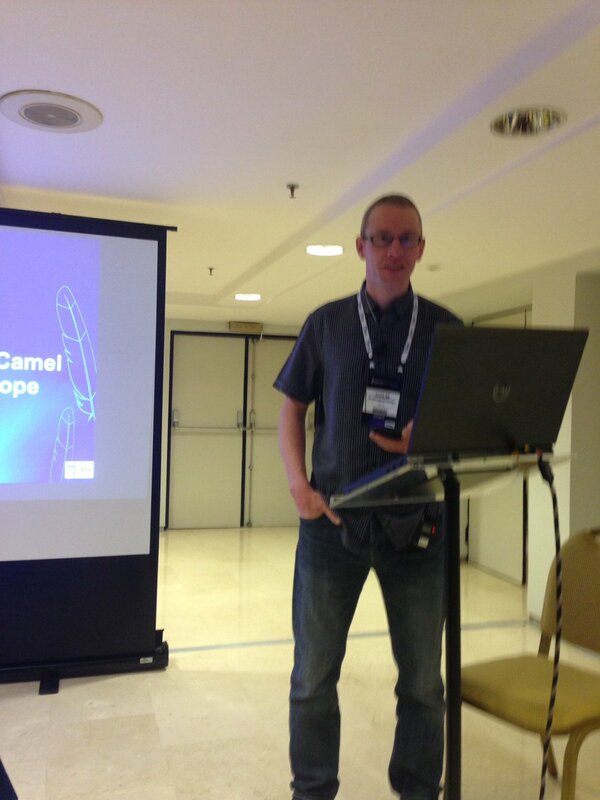 However people turned up and the room was half full and about 1/3 already knew Camel, so I was a on a mission to spread the word about Apache Camel. You can find slides to my talk at my slideshare account. The following speaker Dzmitry Pletnikau talked about how his company are using Camel since 2013 in the real world as a non Java shop. It was interesting to hear how much they can do with Camel XML and a ServiceMix container running in docker so developers dont need any Java installed locally and just drop/edit an XML file. Then Colm from Talend talked about the Apache Syncope (identity management) project and how they have integrated with Apache Camel that adds a lot of power to what you can do. The last Camel talk of the day was Bilgin Ibryam whom talked about cloud native Camel design patterns. Bilgin whom authored the awesome book Camel Design Patterns gave an excellent presentation where he talked about the implications and also new possibilities that the container world brings to the table. 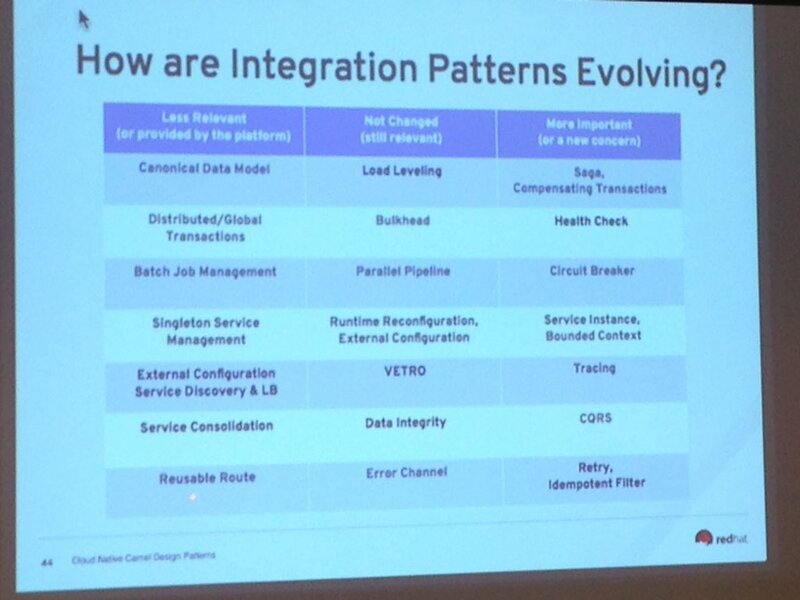 One of his slides had a great summary of integration patterns evolving. How are integration patterns evolving? You can find the slides for Bilgins talk at his slideshare account. 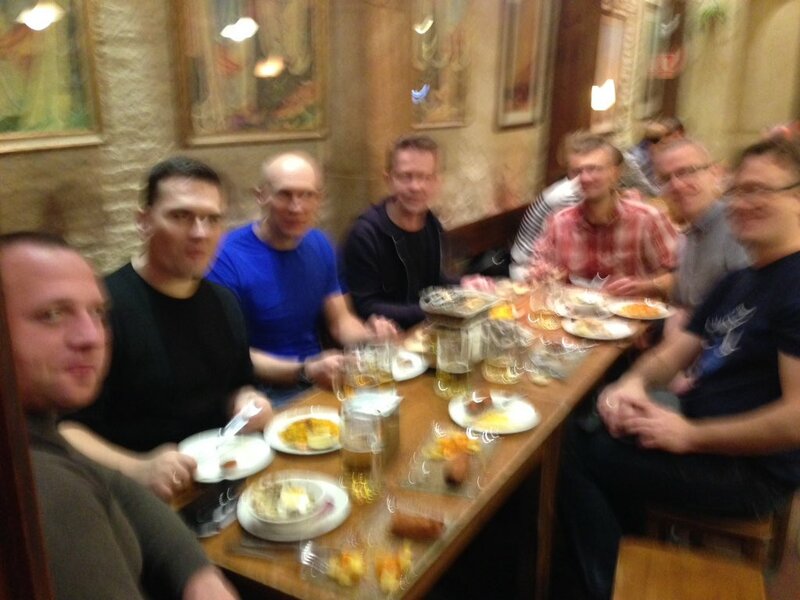 In the evenings Bilgin, myself and Krzysztof had the pleasure of accompanying some of our Apache friends from Talend and go out for tapas and a few beers. The highlight was the first evening on Wednesday where we found an excellent tapas bar with great food. I took a photo but unfortunately it was blurry. I had to return back on friday morning as I have been attending two birthday parties with my friends in Sweden. So I could not attend the last day where Yahoo Japan gave a talk about Apache Camel and how they are using Camel in their production systems in Japan. I had the pleasure of meeting the speakers the day before and talk about Camel and what they are doing. I also had many other hallway talks with attendees and fellow speakers about Open Source, Apache, and Apache Camel. It was great meeting so many and hearing about what is happening. ApacheCon EU 2016 was great, and the location in Sevilla is awesome. I hope to be back in 2017 if Camel still sparks interrest and my talk is accepted. 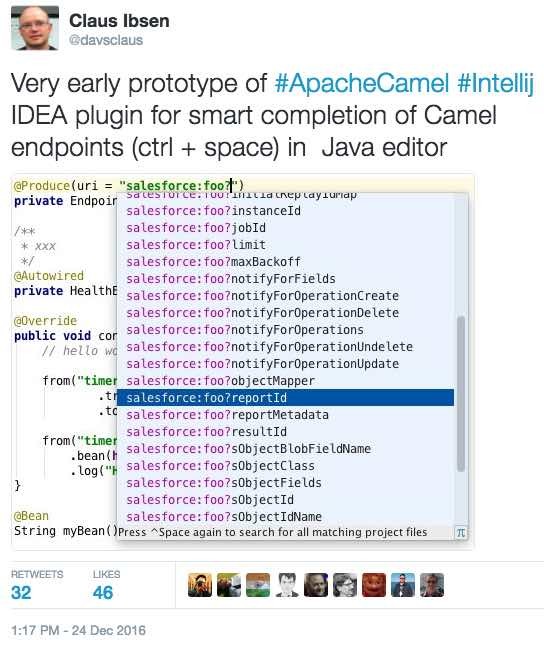 Apache Camel was created before github existed. The project is hosted at ASF on their infrastructure. ASF integrated with github 4-5 years ago and all their projects are mirrored to github. 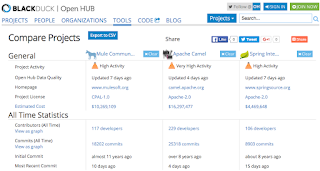 For example the first PR at github to Apache Camel is from November 2012. In those 4 years at github we have seen more involvement from the community. Its much easier for users to provide code changes as github PRs and as such we have merged/closed 1246 as of today. A rough estimate is 95% of those PRs are from outside contributors, and 5% from Camel team itself. At github projects can be starred by users whom seems to like the project. I personally do star other projects there whom I am using or have been used in the past which has benefited me. As of now Apache Camel has 1030 stars. Thank you for showing the support for the project. I just booked my hotel and flight tickets for ApacheCon EU 2016 which is hosted in Sevilla Spain. Its a city I have never visited so I am looking forward to the trip. I will fly in on Monday so I have a full day before ApacheCon starts, where I plan to walk the streets and soak in some of the local atmosphere, food, coffee and maybe a beer ;). 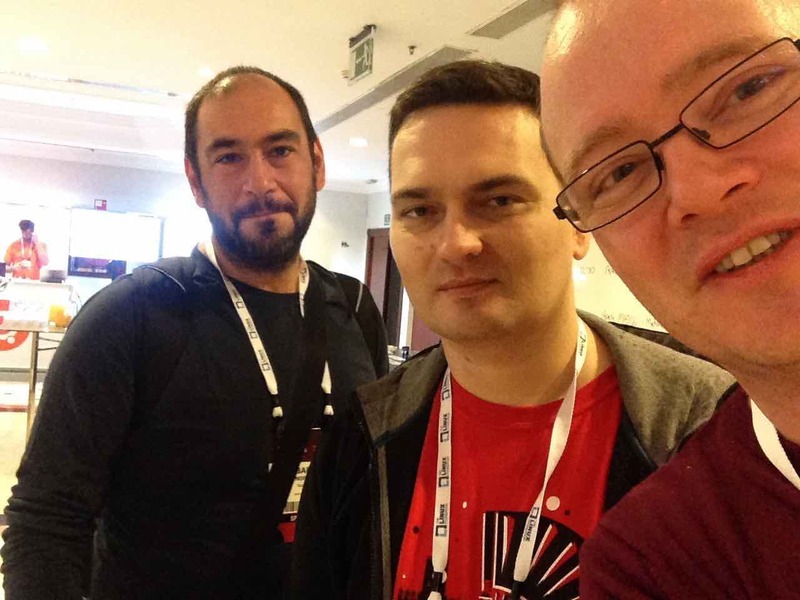 ApacheCon EU starts on Wednesday 16h November and ends on Friday 18th. 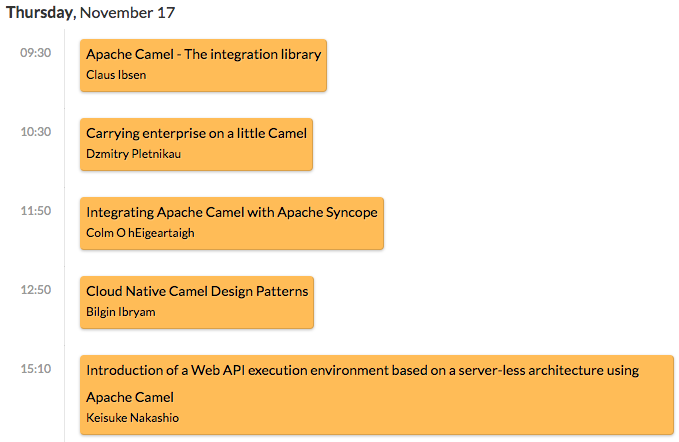 On the day between Thursday there is an entire full day track about Apache Camel. I have the honor of kick off the track with my talk about Apache Camel - The integration library. Of the other talks on the day I want to point out Bilgin's talk Cloud Native Camel Design Patterns. Biligin whom is a senior Camel architect/consultant has many years of experience in the field, and based on his knowledge he catalog a book Camel Design Patterns that has the modern patterns about microservices and cloud technologies. I really enjoy his book, which is highly recommended. As a long term Camel user I am looking forward to attend and see all the other Camel talks to see how other users fare with Camel. If you have interest in Apache Camel, then I hope you can attend ApacheCon EU. I love the hallway conversations at the conferences and events I attend. 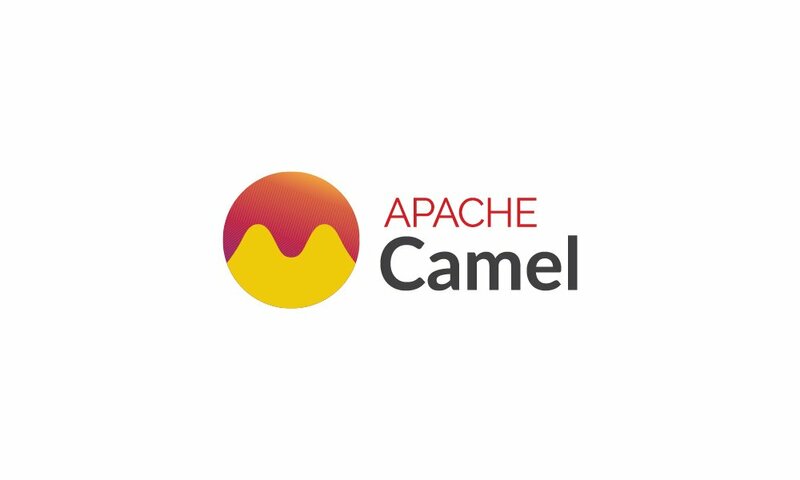 This week Apache Camel 2.18.0 was released. This release is a significant release which I will highlight in this blog post. Camel 2.18 is the first release that requires Java 1.8 (eg easy to remember Camel 2.18 = Java 1.8. 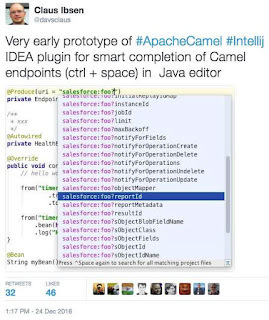 Camel 2.17 = Java 1.7). We have taken a cautious approach and kept the Camel API backwards compatible in the sense as an end user you can take your existing Camel application source code and re-compile them with Java 1.8 and Camel 2.18 and you should be all good. 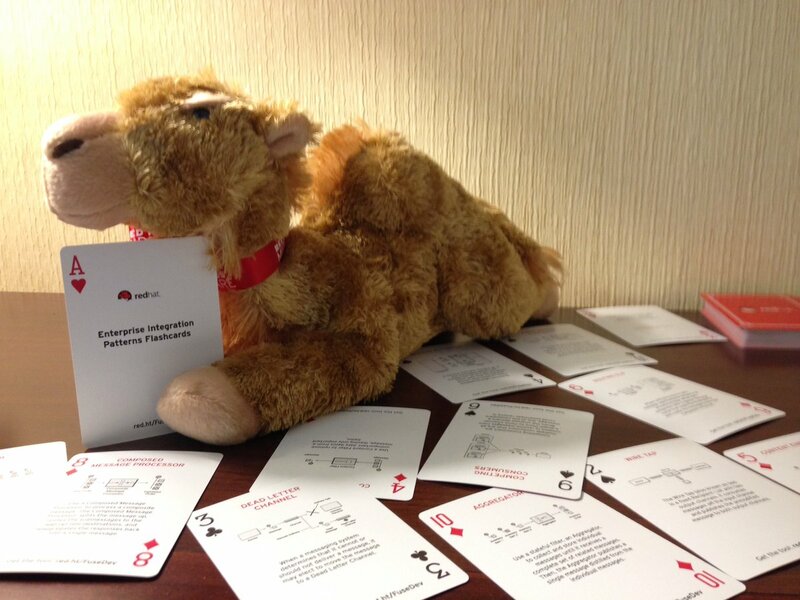 Internally in the Camel source code we have started using Java 8 APIs for new functionality. Existing functionality is still using Java 7 APIs so we can easily backport bug fixes to the older versions. We have also gently introduced a few Java 8 lambda/functional APIs into the Java RouteBuilder you can use in predicates and message transformations. You can view a little example at github. We had support for Spring Boot since Camel 2.15, but in this release we have curated all the Camel components to align and make them work as first class Spring Boot starter components. This means you should use -starter as your dependencies, such as camel-kafka-starter. All the Camel components now generate Spring Boot auto configuration source code which means you can configure components, data formats, languages etc using Spring Boot configuration. For example in the application.properties file. And on top of that tooling such as IDEA, Eclipse etc which has support for Spring Boot will have code completions when editing the application.properties file. Nicola Ferraro whom help implement posted a blog entry with more details. Apache Camel comes with health check integrated with Spring Boot if you are using actuators. The health check does a coarse grain check that Camel did start up properly. We plan to implement a deeper Health Check API in Camel to allow individual components to participate in the check. For example to check if the component can connect to a remote system and so on. The WildFly Swarm project also has great support for Apache Camel. However this development happens at the wildfly-camel project. 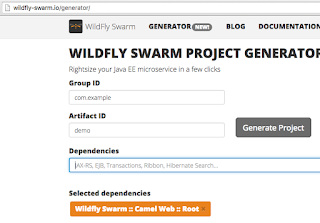 WildFly-Camel released version 4.3.0 that supports Camel 2.18.0. I have previously blogged about that we are working on keeping and generating the Camel documentation from the source code. This means that every Camel component, eip, language, data format etc. all have their options documented in the source code, which we then extract during build and keep the accompanying documentation up to date. We have migrated almost all the documentation from the old wiki system to .adoc files in the source code. We will continue this work to complete this for the next release, and will work on build a new website. We also have a Maven plugin that can scan all your source code and report invalid configuring Camel endpoints. This plugin is currently hosted at fabric8 where we can foster innovation faster. However when the plugin matures then we plan to donate the source code to Apache Camel project to be included out of the box. The XML XSD for Spring and Blueprint now also includes documentation for the configuration you can do outside routes, such as on and other global configurations. 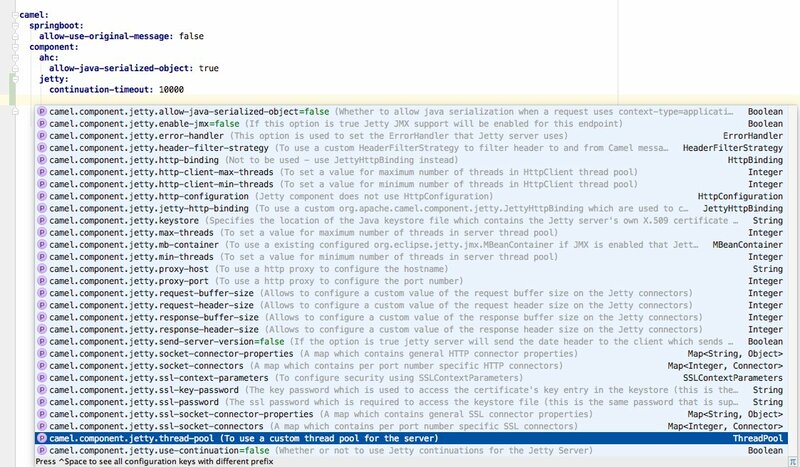 The Rest component allows to call REST services now (as a client), where you can pick one of the following Camel components for the HTTP transport: http, http4, netty4-http, jetty, restlet, undertow. You can also refer to a existing swagger api doc and include camel-swagger-java on the classpath, for automatic validation of rest endpoint is configured to use a valid rest operation/parameters. 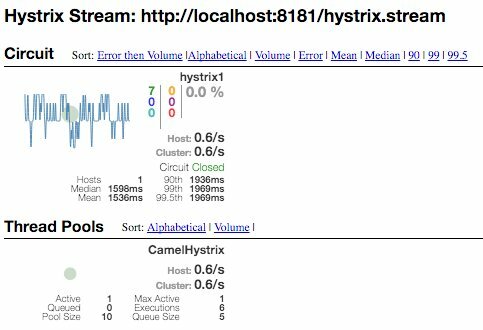 We added native support for using Netflixx Hystrix as circuit break in your Camel routes. There is an example included. Below is another example from an example with Spring Boot calling a service running on WildFly Swarm that runs on Kubernetes cluster (or local) which I have been giving talks about recently. The release also includes camel-zipkin which allows to use zipkin for distributed message tracing. You can find more details with the provided example. The Service Call EIP allows to call remote services with service discovery from a pluggable service registry. For example you can use etdc, consul, ribbon, kubernetes and others are coming. camel-cm-sms - For sending SMS messages using SM SMS Gateway. camel-consul - For integrating your application with Consul. camel-ehcache - For interacting with Ehcache 3 cache. camel-flink - Bridges Camel connectors with Apache Flink tasks. camel-ribbon - To use Netflixx Ribbon with the Service Call EIP. camel-servicenow - For cloud management with ServiceNow. camel-telegram - For messaging with Telegram. camel-zipkin - For tracking Camel message flows/timings using zipkin. camel-chronicle - For interacting with OpenHFT's Chronicle-Engine. camel-johnzon - Apache Johnzon is an implementation of JSR-353 (JavaTM API for JSON Processing). Older versions of Spring such as 3.x and 4.0.x has been dropped. OSGi users on ServiceMix/Karaf should also be using Karaf 4.x. However it may work on some older Karaf versions, but its not officially supported. The next release will drop support for older releases for sure. OSGi users with Spring-DM should install camel-spring-dm module as Spring DM has been removed from camel-spring. Spring Boot 1.4.x is now required. We will work on a Camel 2.19 release where we can further improve on the trajectory the Camel 2.18 release brings us with the new path on Java 8. We also want to finish migrating the documentation and work on a new website. Hopefully we can also get a nice logo. Followed by Camel 2.19, we will get started on Camel 3.x. But this will be discussed in the Camel community first. However for the remainder of this year, we will focus on Camel 2.19 which is planned for start of / Q1 2017. Yesterday I was on my way to USA to attend and speak at two events in Atlanta and Minneapolis that Red Hat is hosting. My flight was delayed 3.5 hours and I was given a voucher with the value of 79 DKK which I could only spend in certain shops and restaurants. So I asked myself - Is it to early for a beer because the time was 10:30 am? ... No never when you are in an Airport. I worked a bit on my slides and when I was done with that, I though - Could I install Kubernetes using a single command, while I was drinking my 2nd order which was a Whiskey Sour? So I deleted Kubernetes, fabric8 and what else I had on my laptop and got myself prepared and pressed the video record button. After 18 minutes of recording .. I can answer that Yes you can. ... can be run in any directory. There is no pom.xml file in the directory where I run the command. You can find more information in the fabric8 maven documentation. 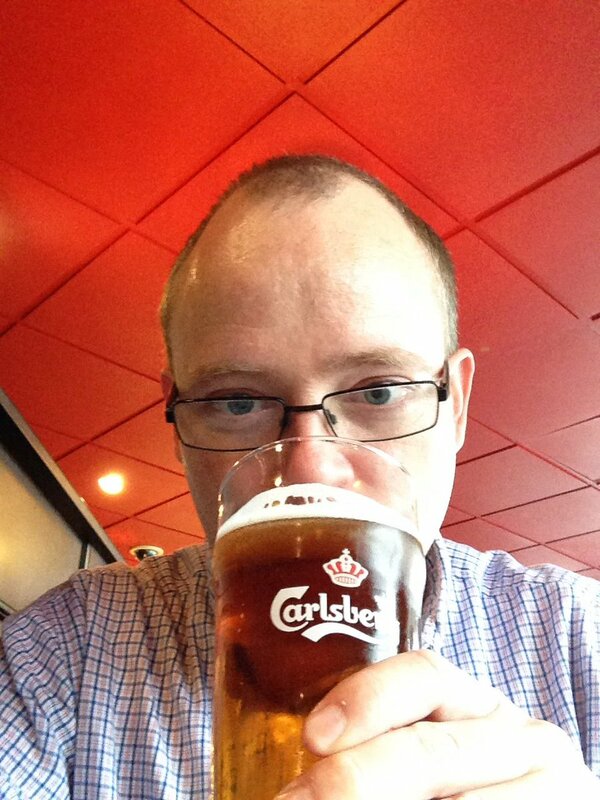 And also if you haven't read James Strachan recent excellent blog about the busy Java developer, then I highly recommend to take a look at that too. PS: I did make another spelling mistake. Did you spot it? .. 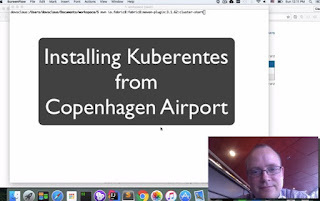 It was in the text box in the beginning where I typed Kuberentes instead of Kubernetes. Last week I gave two talks at JDKIO 2016 in Copenhagen. I want to thank Javagruppen for organizing this conference and having my come to my home country and spread the love about Apache Camel and fabric8. We had a group photo of all the speaks and organizers taken at the lovely waterfront in front of the Royal Library. The talks was video recorded and just published to youtube today. Links for video and slides. Links for video slides and source code. I have just got all my flight tickets and hotel bookings confirmed and are set for going to America in early October. The event is a full day event, where fabric8 and friends are speaking about the technologies and projects we work on. James, Claus, and other speakers will discuss topics including: Kubernetes for Java developers, microservices with Apache Camel, microservices workflow, Integrated Platform-as-a-Service (iPaaS), and API-centric architectures. I will bring along some of my fellow fabric8 colleagues: James Strachan, James Rawlings and Rob Davies from the EU, and we are joined by Christian Posta from the states. 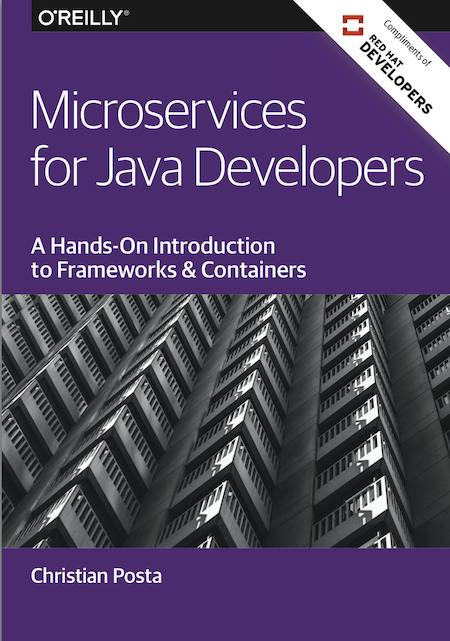 And I am sure Christian bring along a number of copies of his recent book: Microservices for Java Developers. And if you ask him I am sure he will also sign the book. I am still waiting for a chance myself to get hand on a hardcopy of the book. We will be in Atlanta first, where the event take place on Tuesday 4th of October followed by the event in Minneapolis hosted on Thursday 6th of October. I am glad to be visiting the state of Georgia again, where I spoke at the DevNexus conference five years ago. Minneapolis will be my first visit to the state of Minnesota. Minneapolis got my attention recently when I learned that Metallica played a rock concert there in what I assume is a new/rebuild stadium - feel free to correct me. I have previously blogged about these kind of events such as last time we went to New York. Hope to see you at either of the events, and we love to chat, and also share a beer. You can find more details about the event, venue, and time at the event page. PS: Yes you would need to register if you are going. The event page has more details. PPS: If you need accommodation, then we are staying in the Hotel Indigo in Atlanta, and Hilton Garden Inn in Minneapolis. I am not aware of any discount code for hotels. I gave a presentation at Riga Dev Day 2016 which was recorded and posted online on youtube today. The slides for the talk is available on slideshare here. The so-called experts are saying microservices and containers will change the way we build, maintain, operate, and integrate applications. This talk is intended for Java developers who wants to hear and see how you can develop Java microservices that runs in containers. This talk uses Apache Camel as the Java library to build microservice architectured applications. At first we introduce you to Apache Camel and show how you can easily get started with Camel on your computer, and build a microservice application that runs on CDI and Spring-Boot. The second part of this talk is about running Camel (or any Java project) on Docker and Kubernetes. We start covering the basic concepts you as a Java developer must understand about Kubernetes. Then we show how to migrate Java projects to build as Docker images and deployable on Kubernetes, with help from fabric8 Maven tooling. You will also hear about how to make your microservices scalable and distributed by leveraging the facilities that Kubernetes provides for truly distributed services with load balancing and location independence. You will also see how to manage your container using the Kubernetes CLI and the fabric8 web console. At the end we have a bit of fun with scaling up and down your Camel application to see how resilient the application is, when we kill containers. This talk is a 50/50 mix between slides and demo. Its been a while since my last blog post or video. 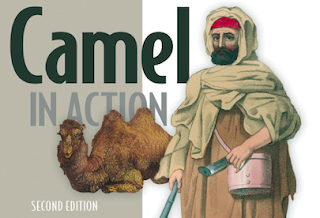 I wanted to say some words about the progress of the work we do on the Camel in Action 2nd edition book. I have noted in my calendar that I started writing the first words on Saturday March 7h 2015. Today one year later we are close to having 13 chapters done. Jonathan is finishing up the final touches on chapter 2. 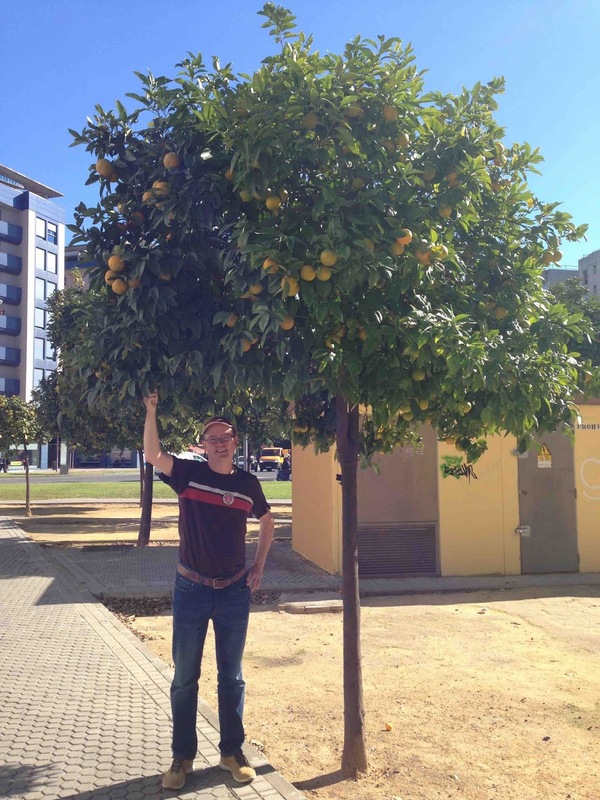 And yesterday I handed up my updates to the testing chapter to include a section covering Citrus Integration Testing with Camel. All together on page counts, we have now surpassed the 1st edition which was 550 pages, and I estimate we are closing in on 600 pages. My last two chapters was rather long with about 70 pages each. We are up for 2/3 round review where we will receive very valuable feedback from our readers. Thanks a lot. It really helps us steer the book in the right directions, and also help us focus on covering topics that are of the most interest. There is still a many miles until we get to the finish line. But we are about to pass 66% and I am preparing for writing the chapter about microservices with Camel. I believe its a chapter that readers are looking forward to have in their hands. Just a few words about writing a computer tech book. Its a lot of work besides the words on paper. At the same time we are building examples and providing source code for the book. And that do also take up a lot of time to do these code bits correct and of interest. We also spend time adding code comments and organizing the source code so you can browse the code on github, and quickly refer to where the code is being covered in detail in the book. And you do this on a moving target. Apache Camel keeps marching on as usual, and we are very active working on the next release. At the same time Jonathan and I have to take notes about which of these changes/new features/etc are impacting the book. And then from time to time we have to circle back in past chapters and make updates accordingly. So when you see that 10 out of 19 chapters are done in the Manning website. Then they are not done done. We are only done done when Manning tells us we are so, and that the book is heading into print. Well even so we are not done done, because after the book has been published, we keep updating the accompanying source code with future Camel releases. We have done that for 5 years since the 1st edition was published. Besides updates the source code we unfortunately may have mistakes slipping into the book, so with thanks from our readers, we have an errata to track those mistakes. With the roads ahead of us I anticipate that Jonathan and I will have all the material ready in fall 2016, and the book enters type setting phase which is a process that Manning handles and that takes its time. That means the book will not be published in 2016, but in start of 2017. Maybe at this time next year I can post a blog with the physical book in hand. That's gonna be a big big book. I estimate its going to be about 50% bigger than the 1st edition, so that is 800 pages. With the Apache Camel 2.17.0 release we have a camel-spring-boot-starter module that has the naming and convention that Spring Boot advises. What would be good is to get Pivotal to add Apache Camel to the list of choices in the http://start.spring.io web application. I have created a github PR with a screenshot of the web app showing Apache Camel. And then notice that thumbs up yellow icon that is just below the description (you may need to scroll a little bit down). Currently it has 27 votes. To cast a vote then hover the mouse just next to the icon, and there should be a "add your reaction" showing you can click and select thumbs up. We want Apache Camel as a choice in start.spring.io !!! Apache Camel 2.17 has just been released. This is the last release to support Java 1.7 which we have previously announced. Here is a breakdown of the top noteworthy changes in this release (in random order). Reworked the Apache Karaf feature to not install camel-spring by default. The problem is camel-spring is using spring-dm which is only supports Spring 3.x, and therefore Spring 3.x was installed and used. All the Camel features that uses Spring JARs are now using Spring 4.x. 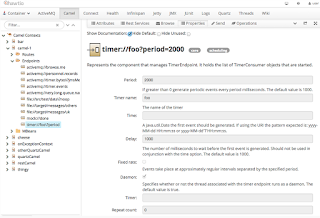 SQL component can now load the SQL queries from external resources so you can use comments and format the queries using multi lines and indents. In addition to that the SQL component now supports SQL IN queries where the IN values are dynamic calculated from the message body. And there is also support for calling stored procedures using the sqlstored component. There is a new camel-spring-boot-starter module that works like any other Spring Boot starter module. The setHeader and setExchangeProperty allows to use a dynamic header key using the Simple language if the name of the key is a Simple language expression. 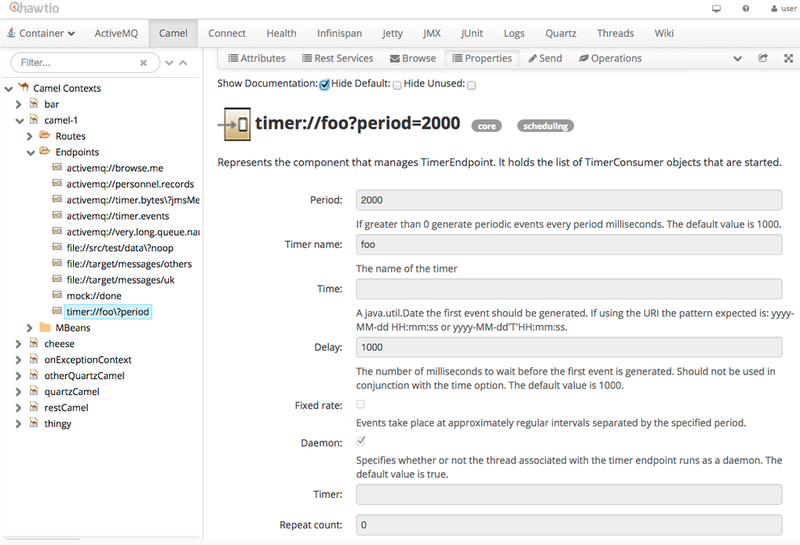 Rest DSL is Swagger API 2.0 compliant. The Rest DSL now only binds from POJO to JSon/XML if the content-type is for json or xml. This allows you to specify a custom content-type and omit the binding, such as when having binary payloads. Using CORS has been improved and fixed. Swagger API can now generate YAML output as well as JSon. Avoid logging sensitive message body details. Exchange and Message now only prints their id when their toString is called. Likewise the Camel Error Handler no longer log message body/header details when logging the Message History. There is an option you can turn this on again if wanted. Complete overhaul and rewrite of the camel-cdi module. Thanks to our new Camel rider Antonin Stefanuti. The camel-kafka module has migrated from using the Kafka Scala library to Kafka Java. The Loop EIP now allows to run in a while loop mode, so it loops until the predicate returns false. And as usual a bunch of new components. This time there is 12 new components and 4 new data formats. For more details see the detailed release notes. And any users who are upgrading then always read the bottom of the release notes about important changes to consider when upgrading. You can download the release from Apache Camel website or from Maven Central if using Maven. The Camel team recently announced that Camel 2.17 would be the last release to support Java 1.7. And that the following release Camel 2.18 will require Java 1.8. So with Java 1.8 being the minimum Java version and that the code is compiled as 1.8 source brings in all the glory of Java 1.8 with aspects from functional programming with lambdas and whatnot. Apache Camel has a huge community of existing Camel users, and we do not want to throw you guys under the bus, with massive Java 1.8 API changes in Apache Camel 2.18. Instead we see this release as a stepping stone towards more Java 1.8 readiness and the next major release Camel 3.0. We have put up an open discussion in the Camel community on the developer mailing list, where you can read and participate. We love to hear feedback from the community. You can read online using nabble where you can also post to the list. Or you can signup using old fashioned mailing list and write emails. But what if you want to provide feedback elsewhere. Well I am sorry but Apache Software Foundation mandates openness and transparency. The discussions about the Apache Camel project must take place using ASF infrastructure such as the mailing list. However you are welcome to post a short comment on this blog, and I can post your comments on the mailing list on your behalf, if you are not arsed to signup on a mailing list, or register using nabble. However you do yourself a favor of signing up the Camel mailing list as there is a ton of information you can learn from other Camel users. Just a word about Camel 3.0. The big goal for Camel 3.0 is less technical but more a new website and new documentation. And we would love to see a new project logo as well. The technical parts are sure there too, but its overdue for a modern website with documentation we maintain from the source code so its much easier and faster to keep it up to date. Also all the EIP and Component options is slurped from the source code to ensure the documentation is 100% in sync.